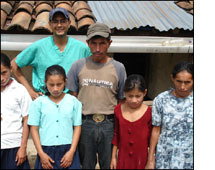 Thank you again for supporting my medical volunteering in Honduras. The week was definitely a significant experience, much more so than I had bargained! My group -- consisting of a dozen first-year medical students and four other providers -- offered care for the communities surrounding Pinares, about an hour from La Esperanza, in the heart of mountainous, rural, underserved Honduras. A clinic was built in Pinares last year to serve the health needs of the region, and a health committee of community leaders formed to delegate resources where they were most needed. Patients came in droves to seek medical attention during the week. Some had to hike through the mountains for hours to get to Pinares. The enormous medical need in the region astounded me. Many of the patients, especially the children, were sicker than any patient I've seen in my own clinic. As expected, infectious disease was a significant issue in nearly every patient. In fact, one teacher at a nearby school brought her class of 30 students before we closed for the week, and literally all of the children had a treatable infection, from scabies to intestinal worms to strep throat. Many were malnourished; all received chewable vitamins. I spent two days in a village far from civilization as I know it. A grueling three hour hike through the mountains was the only way to reach this community. Suffice it to say, no electricity or running water had reached this part of the world. Our group stayed overnight at the village's school, tucking ourselves into our sleeping bags once the sun set at 7pm. I carried a backpack full of medical supplies and visited many people who could not make the trek to the Pinares clinic. Most were elderly, one my age with severe rheumatoid arthritis. The toughest was telling the mother of a two year old with severe cerebral palsy who was having daily seizures that I really had nothing to offer. The second effort was a public health campaign for cleaner water. Water-borne disease is rampant in the region due to the fact that most individuals obtain their water from the nearest murky pond or stream. The local health committee had decided a few months earlier to tackle this problem. Our week in Pinares was the start of this campaign by providing a test of ceramic filters lined with antibiotic silver. The health committee identified two villages that would receive the test filters for a nominal price. We held meetings in each community to demonstrate their proper usage, delivered the filters and reiterated their use, and tested the water supply before and after. The water supplies will be retested in 3 and 6 months, and the families interviewed, to ensure that the filters truly work before offering them widely. My week as a medical volunteer was tiring, but so rewarding, and it put everything in perspective. I hope I was able to make a small difference in the lives of patients I saw. They undoubtedly make a lasting difference in mine.